For most people, writing a will is approached with the same enthusiasm as getting a root canal. But much like the dreaded dental procedure, drawing up a will is something that is best taken care of early, rather than waiting for an emergency to arise. Many people falsely believe that only the wealthy need to have wills. The fact is that anyone with assets should prepare a legal document designating what should happen to their belongings in the event of their death. If someone dies without a will, the law will allocate their assets, which very well may be in disagreement with how that person would have chosen to disperse them. There are many misconceptions about how assets are divided when no will exists, so the only way to assure that an estate is divided as its owner would have wanted is to have a legally binding will. When properly executed, do-it-yourself (DIY) wills are perfectly legal. There are a number of online sites that offer step by step guides to making a will, and stationery or office supply stores sell fill-in-the-blank forms that are adequate for many people. For those who have fairly straightforward wishes and uncomplicated estates, DIY will kits are likely to be all that is needed to see that their assets are disbursed according to their instructions. For those who have considerable estates or unusual family/business circumstances, the services of an attorney specializing in estate matters. Buying a Home: A will should be in place when property is purchased, since most people have at least some equity in the real estate that they own. Also, if real estate is purchased with a partner, a will should specify the writer’s intentions for their share of the partnership assets. Marriage and Divorce: Any change of marital status also requires will revisions to name appropriate beneficiaries. A new marriage automatically nullifies an existing will, so a new will must be drawn up to reflect the estate owner’s current marital status. A will should also be written to reflect the end of a marriage or a legal separation -- few people would relish the idea of their ex inheriting the bulk of their estate! One more thing to think about -- the law does not recognise non-married domestic partners in matters of estates, so in order to provide for a common law spouse, they must be specifically mentioned in the will. Parenthood: Few things change lives and priorities more than the addition of children. Parents naturally want to look out for the best interests of their children, so their wishes should be reflected in the wording of their wills. It is important to note that only natural and legally adopted children are automatically recognised, so those who wish to include step-children need to name them specifically. Sorting Out Your Stuff: In addition to making provisions for monetary funds and real estate, many people have preferences as to who should take possession of some (or all) personal property. For example, a will can be used to declare an estate owner’s desire to have a favoured niece inherit the family’s heirloom china or a wish that a brother takes full ownership of the classic car that the two have restored together. Even small items that may hold only sentimental value can and should be mentioned, since it is just these types of items that can sometimes cause family discord if the wishes of the deceased are unknown. Charitable Donations: Those who hope to leave a sum of money to a specific charity at the time of their death should specify so in their will. Survivors can only guess at what the estate owner would have wanted unless their wishes have been clearly expressed. The more detailed the will, the likelier it is that an estate will be divided exactly as the deceased would have wanted. For this reason, careful consideration should be given when drawing up a will, with a thorough inventory of assets being taken. 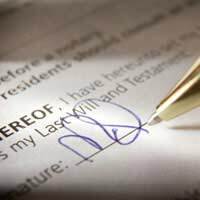 Additionally, a will can (and should) name an executor, or person who will take responsibility for seeing that the estate is divided as specified. This person can be a family member, friend, or attorney. A will can also set limitations on inheritances; for instance, a parent can request that their children wait until they are a bit older than the legal minimum in order to receive the bulk of their inheritance, increasing the chances that they will have the maturity to use it wisely. While no one expects the process of preparing a will to be fun, it is nonetheless an important responsibility that should not be shirked. When a person dies intestate (without a will), there are no guarantees that their assets will be divided in a fashion that would have pleased them. And after all, the very person who spent a lifetime gathering funds and property should have the final say as to where these things end up.